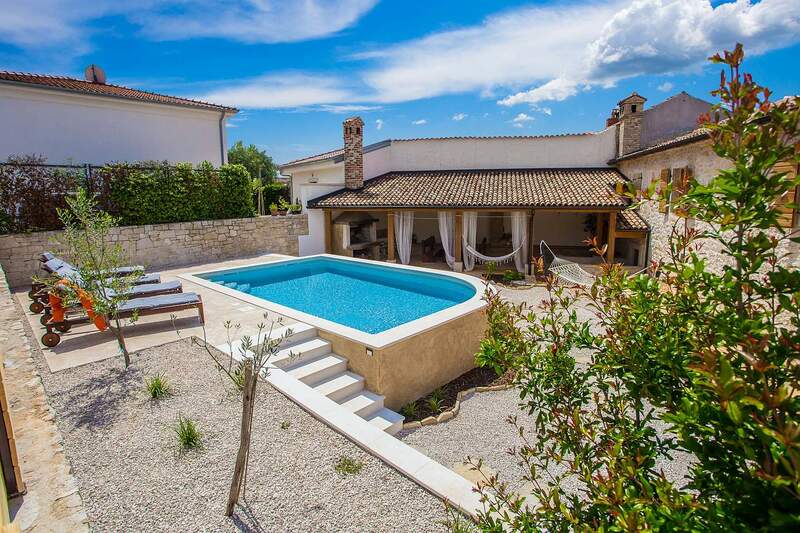 Casa Jagoda is a renovated traditional stone house, located in the picturesque town Visnjan in central Istria, about 12 km from Porec and 11 km from the nearest beach. The house is situated on two floors, built in 1900 and completely renovated in 2014. It is located in the street not far away from the centre of this quiet town. 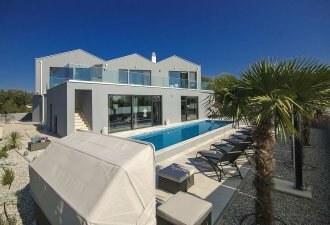 The property has its own enclosed garden of 300 sqm where the guests of this house have on their disposal a private swimming pool, large covered terrace with garden furniture and barbecue and a well maintained garden with swings for children. Directly next to the garden is a public parking. The owner of the house does not live on the property. Holiday house for 4-6 persons with a total living area of 110 sqm (semidetached house) on two floors. On the ground floor there is a living room with two-persons sleeping couch, fully equipped kitchen, tavern/dining room with fireplace and a separate toilet. On the first floor there are two double bedrooms from which one is with a double bed and its own terrace and the other with twin beds, shower/toilet. superschönes Ferienhaus mit hervorragender Ausstattung. Sehr schöne Terrasse mit Grillmöglichkeit. Freundliche und bemühte Vermieter. Restaurant, Bäcker, Supermarkt in 3 Gehminuten zu erreichen. Ideal auch mit Hund, weil großer Wald in der Nähe ist. Wir kommen gern wieder. Sehr schönes Haus. Sehr sauber und hat alles an Ausstattung was man braucht. . Alles ist wie auf den Bildern zu sehen ist.